The midwest has always been perceived as rural, traditional, and homogenous. From its “simple beginnings” and its focus on farming and then the onset of mass manufacturing, the midwest is not really known for pushing boundaries, embracing the avant-garde, or exploring the less representational sides of the art world. However, through American migration patterns, the development of large urban cores, and the general blossoming of contemporary art through the advent of the internet, the midwest has on multiple occasions become the breeding ground for some of the art world’s strongest minds like Ellsworth Kelly, Elizabeth Murray, and many others. When it comes to abstraction, especially the high forms like non-objective and minimalist abstraction, there are still a number of obstacles keeping many artists and exhibition spaces from fully embracing its potential. This mostly stems from a lower level of public support and less of a cultural heritage in our region. To be an midwestern abstract painter many times means that you must play the rebel, and make works in the face of popular form. It can also lead to less financial support until you find your market and can grow independently from your direct surroundings. Thankfully, there are examples of amazing abstract painters in the Fort Wayne art community who have developed tremendous skills and navigated through these often alarming trends. These artists like Michael Poorman, Norman Bradley, and Catherine Blyth are strong examples of what to do, and how to do it with grace. Catherine Blyth, one of the more recent names within the Fort Wayne arts community is a highly skilled abstract painter whose work tends to lean toward the non-objective, but never seems to fully relinquish its holds on familiar forms, color associations, and connections to the world around us. A non-native of Fort Wayne, Blyth is originally from Charleston, South Carolina, where she received her BFA, then went to Indiana University to receive her MFA, and came to Fort Wayne by way of the east coast. The intuitive interaction between composition and color that Blyth mentions is especially noticed in pieces like “Monoliths”, with its blurs and scratches of strong, pure, warm colors, and the muddied rectangular forms which flow out of the introduction of white and black. The scrawling forms crosshatching the background of the image gives “Monoliths” a vague movement or a flickering, and adds a foundation to the structured textures. 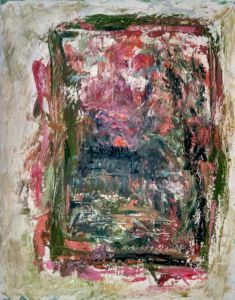 Similarly, in “Inside Looking Out (or outside looking in)”, Blyth creates a broiling froth of color and form which ultimately becomes a window and landscape. The swirling brushstrokes and build up of color are reminiscent of Joan Mitchell’s distinctive style, and give this work an equally impressive aura. In other images like “Lost in Between” and “Patchy Fog”, Blyth creates dense layers of neutral undulating color which obscures the viewer's experience of the bright brushstrokes below, tempering the viewer and giving these pieces great rests while still giving the viewer push and pull in gentle ways. The textures in these pieces are much more subtle and solid. Texture plays a strong role in Blyth’s work, giving her images as much of a physical presence as a visual one. In many ways, Blyth’s work seems to be an expression of gestalt psychological tropes and she becomes the medium translating them out of our collective unconscious. From the blank canvas to the chaotic application of color, common forms emerge effortlessly and repeatedly reminding the viewer of doorways, astronomical bodies, domestic objects, and more. Through this process, the viewer is wrapped up in the simplicity and intimacy of these forms as they explore the color and texture fields of the pieces themselves. This kind of non-objective imagery referencing common forms through the subconscious interaction with the viewer gives Blyth’s work great power. By not giving the viewer too much, and by not having a strict definition of the images and forms she is creating, Blyth truly works through every minute detail of each piece, painstakingly constructing something from nothing. Without artists like Catherine Blyth pushing forward and presenting powerful bodies of work like she does in “Place and Time”, Fort Wayne will never move beyond an understanding of art as being representational of the objects and scenes we find around us. It is also very important to inspire others to attempt abstract work like this- without a lineage, most forms of art will dissipate or stutter in their growth. And through a more often presentation of abstraction, and bodies of abstraction, hopefully the Fort Wayne viewing public can slowly but surely gain a stronger appreciation for other methods of feeling and perceiving. Truly, abstraction is nothing more than another way to see the world around us and within us, through color and form, pattern and texture. 4 people	reviwed this story with an average rating of 4.7.